Wild Dolphin Virtual Reality, a drug-free medicine! Hippocrates already pointed it out; The value of understanding the connectedness between the healing power of nature surrounding us and the healing power of the nature residing within us. What can be more enchanting than being surrounded by a pod of wild dolphins? Many people dream of swimming with wild dolphins. And not without good reason. Most people who have had such an encounter, describe their feelings of having contact with a different but strangely familiar and benevolent intelligence. Looking into the eye of a dolphin or a whale sparks our imagination, and brings us to wonder: who is observing whom? Somehow most of us can relate to this positive and magical bond between dolphins and people which has been accounted for over thousands of years. Legends and stories are universal as well as abundant, ancient and of more recent date. Our wild dolphin Virtual Reality experience transports the viewer to be immersed in the dolphin’s serene underwater ocean world. This proves to have a significant therapeutic effect. It reduces pain and anxiety. 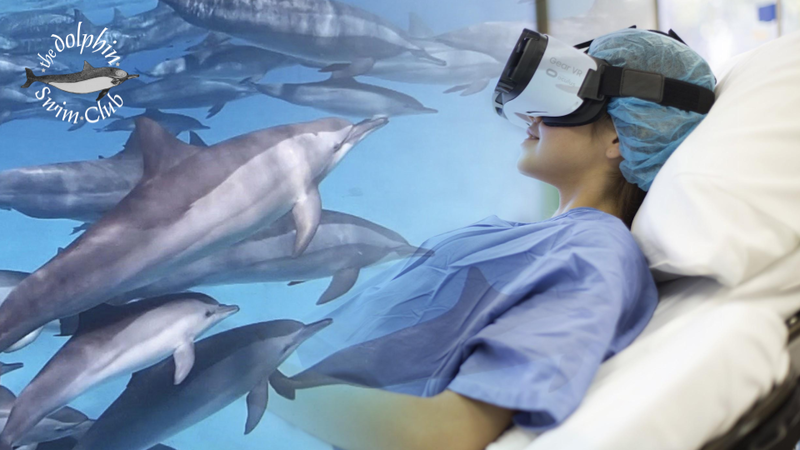 The Dolphin Swim Club is delighted to bring this healing experience as a Medical VR solution to patients worldwide. Today we are in use in more than 450 hospitals and healthcare institutions worldwide. A new drug-free medicine without side-effects for patients or dolphins. Dolphins get to be wild and free. And if patients need fewer farmaceuticals, this means lower cost in healthcare as well as a profit for the environment. Maybe virtual dolphins don’t just help us escape reality. They help us live in it. Read below about some of the professionals in Medical VR that work with our dolphins. In the beginning of 2016 the Dolphin Swim Club has agreed upon a partnership with professor Skip Rizzo. Professor Rizzo is the Director Medical Virtual Reality of the Institute for Creative Technologies and Research Professor of the Dept. of Psychiatry and School of Gerontology at the University of Southern California. Yep, science, so lot’s of words, actually Skip Rizzo has developed amazing imaginative VR programs to help for example US veterans to cope with Post Traumatic Stress Disorders. He works with MedicalVR since 1995! With the footage of the Dolphin Swim Club, Professor Rizzo will look into the field of 360°VR treatment of patients with autism. In September 2016 we have presented the project of the Dolphin Swim Club at a conference in Los Angeles, about VR in pain management. We came in touch with Dr. JoAnn Difede from Weill Cornell Medicine and discussed the implementation of our content within a clinical research study. Dr. Difede, is a Professor of Psychology in Psychiatry at Weill Medicine, an Attending Psychologist at the New York Presbyterian Hospital, and Director of the Program for Anxiety and Traumatic Stress Studies (PATSS). She is internationally recognized for her pioneering work using virtual reality technology in the treatment of PTSD consequent to the WTC attack of September 11, 2001, and more recently in the treatment of combat-related PTSD. Dr. Difede currently uses our Dolphin footage during a study where people undergoing treatment for burning wounds. Clients of Dutch healthcare facility ‘s Heeren Loo (10.ooo residents) can enjoy Virtual Reality in specially developed relaxation rooms. A study took place with a group of 55 mildly mental handicapped residents, suffering from very high-stress levels. 82% Showed and reported a considerable improvement after experiencing the Dolphin Swim Club VR on a regular base. One man no longer experienced the chronic pains he continuously had in his arm. A girl with autism almost didn’t sleep for 4 years, but now she swims-with-the-dolphins before bedtime and redeveloped a healthy sleep pattern. ‘s Heeren Loo is currently testing with the prototype VR goggles of the new developed Underwater VR of the Dolphin Swim Club. As a part of the regular swimming therapy by movement teachers. Swimming in (real) water while watching the (virtual) dolphins in their underwater world will enhance the VR experience, adding an extra layer to the immersion. The handicapped expertise center aims to provide underwater VR to all clients. Thanks to the Norwegian Cancer Society cancer treatment for young Norwegians in need of a bone marrow transplant is a little less harsh. Post operative recovery entails isolation in a sterile tent for up to six weeks. Since late 2016 a set of VR Goggles and the 360°VR movie of the Dolphin Swim Club helps them to cope. Virtual wild dolphins don’t just help them to escape reality. They help them to live in it. In March 2017 doctors at Lucile Packard Children’s Hospital Stanford started a pilot study called ‘ Project Braveheart’ researching the effect of VR on anxiety- and stresslevels. 40 patients, youngsters in the age of 8 to 25, with congenital heart diseases take part. Using VR goggles patients can follow a tour guiding them along the exact path that will take place on the day of their procedure. Throughout the tour, patients can access relaxation programs like ‘Swimming with Wild Dolphins’ – the 360VRmovie of the Dolphin Swim Club. Voluntechies, a non profit organisation based in Spain, is convinced we can improve people’s lives by using new technologies. Volunteers visit hospitalized children, disabled and elderly people, showing them the latest in Virtual Reality and other technologies. They take participants “outside” reality and let them discover the relaxing, healing environment of the wild dolphins swimming and playing along. Both Applied VR as Psious are VR distribution platforms for the healthcare industry. Collaboration with these platforms makes our 360VR movie easily accessible for healthcare professionals. In January 2016 Prof. Wim Veling, psychiatrist of the University Medical Centre in Groningen has decided to start an medical study on the effect of 360° VR-swimming with Dolphins for patients with a depression, with our footage. This research started in April 2016 with a pilot and will last for 2 years.